Runway RunAway on the Road! Lorelei will take some time from her busy schedule to meet & greet you! 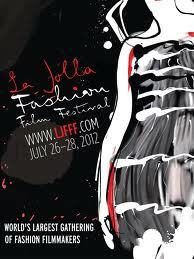 Lorelei Hosts the La Jolla Fashion Film Festival in La Jolla CA!! authentic creative artist that resides within. one of America's greatest designers. collected while working as a designer's MUSE to the world's most iconic designers. Part Three is Interactive and Experiential when Lorelei guides her audience on a journey within, discovering their personal inner beauty, wisdom, entelechy and life purpose bringing to life the creative genius inside us all. SEE THE WINNER ON LORELEI'S FACEBOOK PAGE! see photos of her performance with Taylor Caldwell on Facebook! Private Author Appearance in NYC TBA !!! TO RSVP, email: meetlorelei@gmail.com - provide name, city/date attending and number of guests you'll bring. Hollywood Park 647 N. San Vicente Blvd. 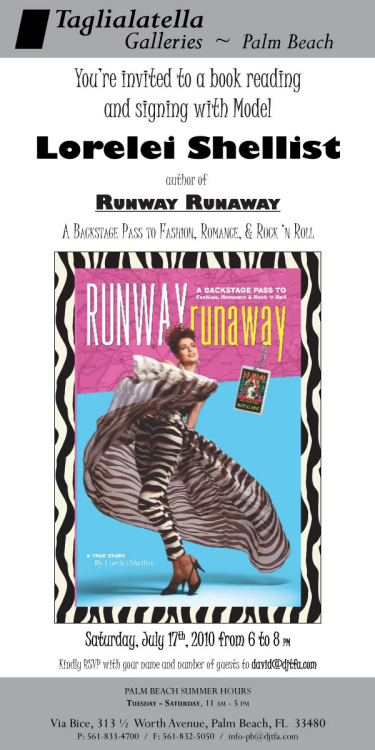 I will be signing Runway RunAway at booth F2 from 2-4PM. I hope you can stop by! TV--Aug 13th : See link AN AMAZING JOURNEY! on Studio10 TV in Tampa Bay. Listen to archives of the show at http://www.wmnf.org/programs/303. Scroll down and enter 8/8/09 to listen. 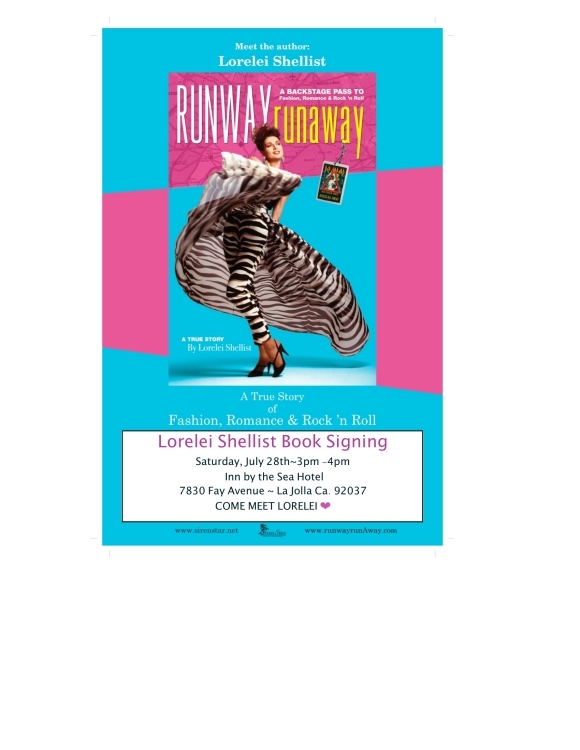 Book Signing and Pre-Concert Party 5:00 -6:00 PM!!! Book Signing and Pre-Concert Party 4:00 -6:00 PM!!! More dates to come - stay tuned! Lorelei will be in Nashville at the CMT Awards where Def Leppard, who are nominated for performance of the year and wide open country video of the year, will be performing. Go figure! YEAH! 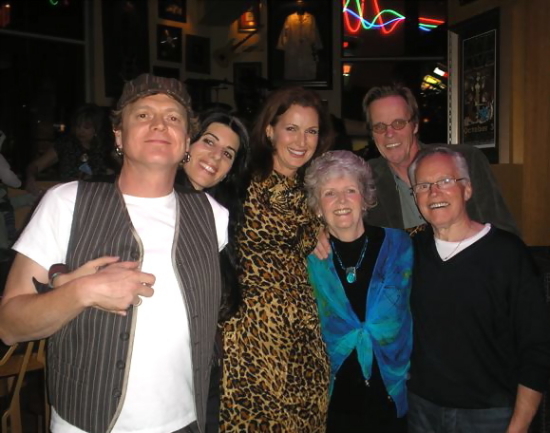 Rick Allen, Lauren Monroe, Lorelei, Rick's mum Kath - all the way from Sheffield - Nick Glennie-Smith, and Rick's step dad Jim at the Hollywood Hard Rock Cafe Jan. 22nd. 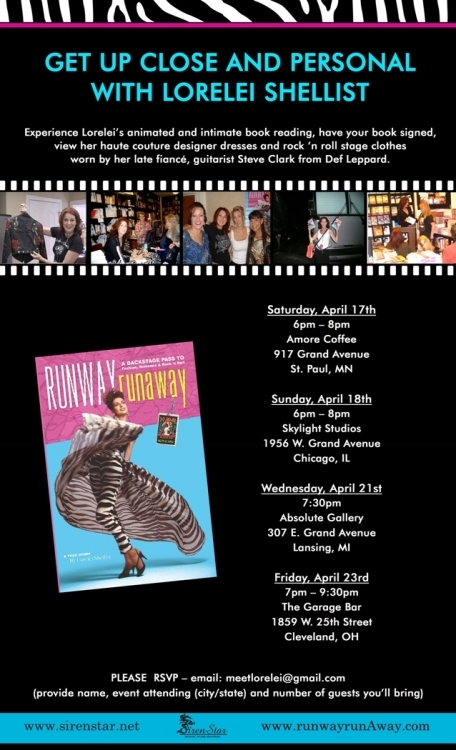 The show and turnout was fantastic, Lorelei did an special theatrical reading with rare memorabilia and stories, Lauren and Rick rocked the house with their soulful, spiritual music. Fans got extra rare face time when the trio signed books and cds and posed for pictures for hours. Thanks to Diana Elmore for all her help on the Hard Rocks end. Hollywood's hippest bookstore - which has lately seen the likes of Hugh Hefner, Veruschka, Maureen McCormick & Pamela des Barres. Book Soup will be hosting the very first book reading/signing. 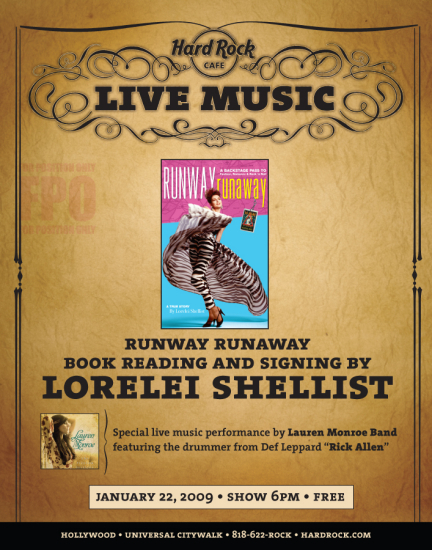 Lorelei will be exhibiting couture fashions & R & R memorabilia from her collection.